The Joint Advisory Group on Gastrointestinal Endoscopy (JAG) was initially established in 1994 to standardise endoscopy training across specialties. Over the last two decades, the position of JAG has evolved to meet its current role of quality assuring all aspects of endoscopy in the UK to provide the highest quality, patient-centred care. Drivers such as changes to healthcare agenda, national audits, advances in research and technology and the advent of population-based cancer screening have underpinned this shift in priority. Over this period, JAG has spearheaded various quality assurance initiatives with support from national stakeholders. These have led to the achievement of notable milestones in endoscopy quality assurance, particularly in the three major areas of: (1) endoscopy training, (2) accreditation of endoscopy services (including the Global Rating Scale), and (3) accreditation of screening endoscopists. These developments have changed the landscape of UK practice, serving as a model to promote excellence in endoscopy. This review provides a summary of JAG initiatives and assesses the impact of JAG on training and endoscopy services within the UK and beyond. QA is the process of monitoring and assessing a product, service or process to ensure that it is of sufficient quality.1 In the 1990s, the expansion and multidisciplinary nature of endoscopy led to calls for a unified advisory body to quality assure endoscopy training.2 Thus, the JAG was established in 1994 under the auspices of the Academy of Royal Medical Colleges with committee members from the Royal Colleges of Physicians, Royal Colleges of Surgeons, Royal Colleges of Radiologists and Royal Colleges of General Practitioners. Although the initial focus was on standardising training between specialties, the role of JAG has progressively evolved to meet its current vision of quality assuring all aspects of endoscopy to provide the highest quality, patient-centred care. Over the last two decades, drivers such as changes to healthcare agenda, national audits, advances in research and technology and the advent of population-based cancer screening have been key in this shift in priority.3 Over this period, JAG has spearheaded various QA initiatives with support from other national stakeholders including the Department of Health (DoH), British Society of Gastroenterology (BSG), Association of Coloproctology of Great Britain and Ireland (ACPGBI), Association of Upper GI Surgeons and Specialist Advisory Committees (SACs). These have led to the achievement of notable milestones in endoscopy QA (table 1), establishing its role in the three major areas of: (1) training, (2) accreditation of services and (3) accreditation of screening endoscopists (figure 1). These developments have changed the landscape of endoscopy practice in the UK and serve as a model to promote excellence in endoscopy. This review provides a summary of JAG initiatives and assesses the impact of JAG on training and endoscopy services within the UK and beyond. The role of JAG.12 Courtesy of Dr John Anderson. BCSP, Bowel Cancer Screening Programme. The unacceptable standards of practice reported in the 1999 UK colonoscopy audit,4 in anticipation of national bowel cancer screening, raised questions over workforce competence. This catalysed a review of endoscopy training, which identified clear needs for defining standards for competent practice, methods for assessing competence and a structured endoscopy curriculum. In response, these elements were covered in a seminal 2004 JAG document,5 which also called for training units to have shared responsibility in ensuring trainee competence. The concept of certification was proposed, which relied on trainee adoption of a ‘JAG logbook of experience’, engagement in summative assessment and supervisor sign-off.5 Direct observation of procedural skills (DOPS) and direct observation of procedural polypectomy skills (DOPyS) were introduced to standardise assessment, and highly focused courses were developed for trainees and trainers. JAG-approved basic upper and lower GI endoscopy courses became compulsory for certification, while specific training-the-trainer courses evolved to improve training standards at base hospitals. The guideline formed the foundations for quality assurance of training (QA-T) and service accreditation (described below). In 2009, the JAG Endoscopy Training System (JETS) was launched. It had four main purposes: (1) an electronic record of trainee procedural experience and assessment, (2) a portal for accessing training courses, (3) to provide evidence of trainees meeting JAG standards of competence and (4) to provide feedback to trainers and training course organisers.1 6 JETS enabled trainee competence to be monitored and determined centrally, paving the way for e-certification, which began in 2011 for upper and lower gastrointestinal (GI) endoscopy (figure 2). By January 2017, JETS had been adopted in >250 UK training centres, with 2857 instances of e-certification awarded.7 JAG training courses are now regularly delivered in 28 UK centres, comprising 10 types of basic skills courses, 9 skills improvement courses and 4 endoscopy trainer courses.8 JAG have also supported non-medical endoscopists and endoscopy nurses via the GI Endoscopy for Nurses programme. JAG trainee certification pathway.12 Courtesy of Dr John Anderson. DOPS, direct observation of procedural skills; JAG, Joint Advisory Group on Gastrointestinal Endoscopy; KPIs, key performance indicators; QA, quality assurance. Shortly after publication of the national colonoscopy audit,4 the 2004 National Confidential Enquiry into Patient Outcome and Death (NCEPOD) report: ‘Scoping our Practice’ also highlighted shortfalls in quality of care.9 The expectation for individual endoscopy units to meet quality standards of care led to centralised accreditation of endoscopy units being proposed in the 2004 JAG position statement.10 The Global Rating Scale (GRS) was developed in 2004 as a quality improvement tool for endoscopy units to self-assess against a number of measures associated with high-quality and safe patient-centred care.11 The GRS assesses patient experience within four domains (table 2), each with corresponding items. Items are scored A–D, with level B indicating attainment of minimum requirements, with level A being an aspirational target for high performing services. To be accredited, units are required to achieve at least level B in all GRS domains and provide substantiating evidence. Service standards are inspected through a peer-review site visit by trained JAG assessors. During the site visit, the unit environment is also assessed to evaluate privacy, dignity and safe decontamination practices. Once awarded, accreditation is renewed annually, with services required to provide interim evidence of eligibility via the annual report card. By 2005, service accreditation achieved national roll-out and became required for services wishing to contribute to bowel cancer screening in England. A JAG subcommittee, now known as the Endoscopy Services Quality Assurance Group, administers and regulates the data collected. In 2013, the Best Practice Tariff was commissioned by the DoH in England, thereby enabling higher rates of reimbursement for accredited units. Additionally, service accreditation become a prerequisite for Trusts to receive trainees in endoscopy,12 further incentivising units to participate in the QA process. 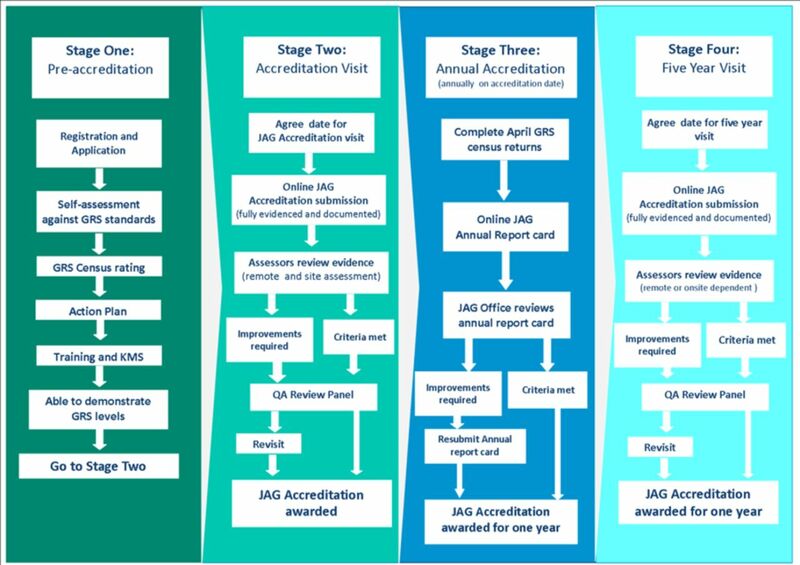 JAG unit accreditation pathway. GRS, Global Rating Scale; JAG, Joint Advisory Group on Gastrointestinal Endoscopy; KMS, Knowledge Management System; QA, quality assurance. The Bowel Cancer Screening Programme (BCSP) operates on the observation that population-based endoscopic screening reduces colorectal cancer (CRC) incidence and mortality.13 In England, the BCSP commenced roll-out in 2006 for colonoscopy and 2013 for flexible sigmoidoscopy (Bowel Scope) screening. At the outset of screening, the Screening Assessment and Accreditation System (SAAS) was launched to quality assure the endoscopists within BCSP.4 In order to achieve accreditation, endoscopists are required to provide evidence of locally verified key performance indicators (KPIs), complete knowledge-based assessments and demonstrate competence in summative assessment (figure 4). BCSP accreditation pathway.12 Courtesy of Dr John Anderson. BCSP, Bowel Cancer Screening Programme; DOPS, direct observation of procedural skills; DOPyS, direct observation of polypectomy skills; JAG, Joint Advisory Group on Gastrointestinal Endoscopy; MCQ, Multiple Choice Questionnaire; NHS, National Health Service. The primary aim of this review was to amalgamate published evidence supporting the impact of JAG on quality of care (ie, patient outcomes), services or training in endoscopy. Secondary aims included assessing the impact of JAG on (1) service implementation and (2) research, where JAG tools were integral to the design. In order to assess the impact of JAG, a comprehensive literature search was conducted in July 2017 through Embase, Ovid and PubMed to identify relevant publications and conferences abstracts over the last 10 years. The search strategy involved the combination of the following terms: (‘Joint Advisory Group’ or ‘JAG’ or ‘Global Rating Scale’ or ‘JETS e-portfolio’ or ‘DOPS’ or ‘DOPyS’ or ‘bowel screening’) AND (‘endoscopy’ or ‘colonoscopy’ or ‘polypectomy’ or ‘accreditation’). Studies were limited to those in English, with accompanying abstracts, and those published after January 2007. For each category, studies were subdivided based on: (A) impact; and (B) implementation: these may demonstrate impact, but specifically include studies where JAG tools/recommendations have resulted in quality improvement of patient or trainee-centred services. For duplicate abstracts, either the full paper was referenced or the earliest instance was selected. Data from eligible articles were extracted into tables to summarise the literature review. Column headings included: (A) first author, (B) year of publication (full papers marked with an asterisk), (C) country, (D) JAG division (ie, training/service accreditation/SAAS), (E) study design, (F) outcomes, (G) results/conclusion and (H) impact of JAG. The search strategy yielded 887 results from full publications and conference proceedings. 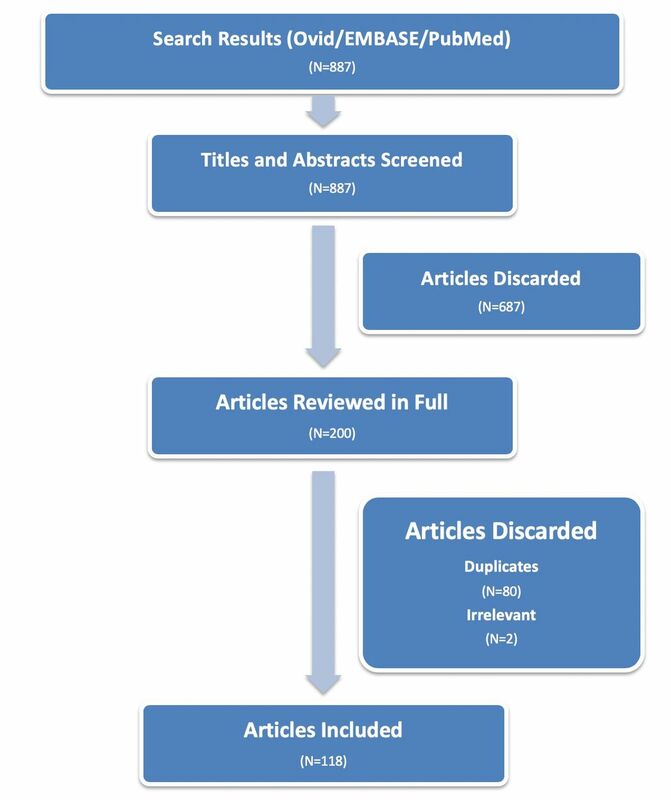 After removing 687 inappropriate results, 80 duplicate and 2 irrelevant studies, 118 publications (43 papers and 75 conference abstracts) were reviewed (figure 5). These were categorised according to the impact of JAG. Results from the literature search. Thirty-four studies were identified that related to quality of care (online supplementary appendix table 1),14–47 with 31 relating to impact and three on implementation. Evidence of variable practice between endoscopists has led to renewed focus on KPIs, which may be used as a surrogate marker for quality and safety in endoscopy. These may assess direct (eg, complication rates) or indirect effects on patient outcomes, for example, endoscopist’s adenoma detection rates as a surrogate for lower post colonoscopy CRC rates and mortality,48 longer colonoscopy withdrawal times correlating with adenoma detection rate (ADR)49 and higher CIR with reduced discomfort and sedation use.50 As such, audits involving KPIs allow services to safeguard patient outcomes and benchmark performance. Several national studies have attributed improvements in care to JAG. In the second UK colonoscopy audit (n=20 085) performed in 2011,30 Gavin et al reported significant improvements in KPIs since the previous audit (table 3), including improvements in CIR from 76.9% in 1999 to 92.3% in 2011. The authors credited improved performance to advances in quality of training and service accreditation. Similar findings were reproduced in a retrospective comparison of colonoscopy KPIs between 2004 and 2012.32 Valori et al36 studied a composite measure coined the performance indicator of colonic intubation (PICI) which incorporated CIR with safe sedation use (midazolam <2 mg) and acceptable (mild–moderate) discomfort scores. On multivariate analysis, endoscopy performed within a JAG-accredited unit was an independent predictor of PICI (OR 1.26; 95% CI 1.16 to 1.35) and higher levels of JAG training were also associated with PICI. Britton et al35 observed that in the UK, there was a lower postcolonoscopy colorectal carcinoma incidence compared with other countries. The authors suggested that advances in quality, driven by JAG and BCSP, may have contributed towards this finding. Three studies described implementation processes related to quality of care. Dewi et al introduced root-cause analyses of perforations following screening colonoscopy, whereby suboptimal management was addressed with individual feedback and training.46 Thompson et al assessed the robustness of the 90% CIR standard by factoring in the conversion of intended colonoscopy procedures to sigmoidoscopy.47 Conversion to flexible sigmoidoscopy (FS) occurred in 4.7%, with the majority lacking valid reasons, which artificially boosted CIR. Falvey et al presented data regarding implementation of nurse-assisted reporting of comfort scores,45 which was associated with significantly higher discomfort than endoscopist-reported scores. This enabled outlier performance to be identified and has since been adopted routinely as a QA measure. Thirty-one studies (online supplementary appendix table 2) were relevant to the impact of JAG on quality of endoscopy services.2 54–83 Twenty-two were relevant to implementation of service, with the majority being GRS based. Fifty-three articles relevant to the impact of JAG on training were identified (online supplementary appendix table 3),1 6 7 12 86–130 of which 29 assessed impact and 24 described training-related implementation. Two in-depth reviews of the role of JAG in endoscopy training are provided by Dunckley1 and Anderson.1 12 The majority of studies relate to QA of training. Haycock et al surveyed changes in quality of training between 2002 and 2007 and reported significant improvements in standards of teaching, reduced trainee complication rates and increased trainee satisfaction, correlating with JAG’s impact.88 89 Dharmasiri et al93 reported high rates of trainee satisfaction with the e-certification system. Other surveys at regional and national levels have exposed disparities in training satisfaction by specialty87 95 103 107 and training region.101 105 In the recently published 2016 BSG trainees survey,130 85% were satisfied with the level of supervision during endoscopy training, with 12.5% reporting no access to regular training lists. Conflicting on-call commitments,130 competition for and absence of training lists are cited as contributory factors,95 104 130 despite the training domain of the GRS, which places onus on individual units to ensure sufficient training opportunities. To overcome these challenges, several studies have evaluated innovative approaches to improve trainee exposure. Walker et al115 described the successful implementation of a dedicated training e-booking system, which improved the uptake of dedicated training lists from 18% in 2007 to 61% in 2010. Similarly, by implementing generic training lists, Lamb et al117 reported increases in mean training lists from 7.8 to 13.6 lists per quarter, which was associated with improvements in trainee KPIs and DOPS counts. Two studies reported improvements in endoscopist KPIs after attendance on a JAG-based course. Hussain et al131 evaluated the performance of four certified endoscopists before and after attendance at a JAG-certified advanced colonoscopy course, specifying improvements in polyp retrieval and biopsy practice for chronic diarrhoea, although improvements in CIR (88%–93%) and minimal–mild discomfort scores (71%–82%) were not statistically significant. In an international study involving JAG faculty members, Kaminski et al132 identified endoscopy leaders from 40 Polish bowel cancer screening centres with suboptimal ADR and randomised them to a Train-Colonoscopy-Leaders (TCL) programme with a 2-day hands-on component or feedback only. The study analysed 24 582 colonoscopies performed by 38 leaders and 56 617 colonoscopies performed by 138 endoscopists at participating centres. The TCL arm had larger improvement in ADR than the feedback group in both early (OR 1.61; p<0.001) and late (OR 1.35; p=0.004) postintervention phases. Effective training is key for competent unsupervised practice. The success of JETS implementation has been well characterised.6 7 114 116 The robustness of endoscopy certification has been evidenced by precertification KPIs during training102 and postcertification KPIs of independently performing specialty trainees.7 24 Based on a 2011 analysis of JETS entries, 28% of specialist trainee procedures were logged as service lists.92 Hence, supporting trainees to achieve certification enables effective contribution to an endoscopy service. The role of DOPS and DOPyS as competence-assessment tools have been evaluated since their introduction in 2004.5 DOPS were first assessed in the context of BCSP, which showed validity and reliability.120 In order to standardise polypectomy assessment, DOPyS were developed,118 validated118 119 and integrated into colonoscopy certification criteria in 2011, with subsequent improvements in trainee polypectomy exposure and standards.129 This has provided a much-needed framework for polypectomy assessment. A recent survey involving 610 colonoscopists from 19 countries unearthed significant variation in polypectomy training internationally.113 Only 4 of the 19 countries, including UK, had specific guidelines for polypectomy training and competency assessment. The impact of the post-July 2016 changes to DOPS has also been published. Implementation of novel DOPS for GI bleeding121 and percutaneous endoscopic gastrostomy (PEG) have been described.135 The endoscopic non-technical skills (ENTSs) domain introduced into new DOPS/DOPyS has also been validated.126 The changes in DOPS scoring from a performance-based to supervision-based scale have improved the quality and validity of assessment tools.127 From a research perspective, DOPS and DOPyS have been integral to studies which appraise the impact of practical and simulator based training,96 99 100 106 108 110 112 136–138 thereby contributing to current understanding of optimal training methods in endoscopy. Similarly, interrogation of the JETS e-portfolio has enabled learning curve analyses for competence in gastroscopy,111 colonoscopy98 and polypectomy,109 which inform trainees, trainers and SACs regarding length of training and variation in learning curves. Several publications provide insights into the future direction of training. As gastroscopy certification does not ensure competence in managing GI bleeding, certification specific for endotherapy has been proposed.128 130 In response to trainee dissatisfaction regarding exposure to training,130 139 the JAG QA-T committee has outlined strategic measures,130 including placing further increasing emphasis on GRS to improve unit-level training delivery and appraisal of measures to reduce time to competency.130 A trial roll-out of accelerated training to specialty trainees has been effective and well received.122 ‘Immersion training’, where blocks of time are dedicated to endoscopy alone, is being considered.130 These approaches may be paired with new e-learning tools to accelerate development of non-technical competencies such as lesion recognition.124 However, the single innovation likely to have greatest impact on training is the impending National Endoscopy Database (NED).125 NED has been designed to autopopulate KPIs from endoscopy reporting systems directly into future iterations of JETS and allow benchmarking of trainee learning curves nationwide. This literature review provides evidence that supports the impact of JAG on quality of care, service and training in UK endoscopy over the last decade. The majority demonstrate a positive impact of JAG. Of note, comparisons of performance metrics between the two national colonoscopy audits4 30 and the fall in national waiting times64 are testament to advances in quality at both endoscopist and unit levels. The promotion of the QA framework has underpinned the success of JAG. 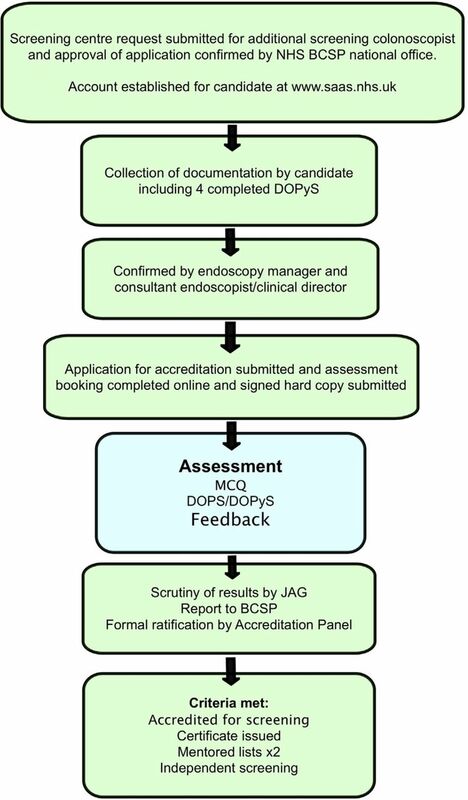 QA in endoscopy is reliant on: (1) definition of quality standards, (2) measuring quality by comparing against quality standards, (3) methods for improving quality and (4) providing incentives for participation.1 Continuous audit and quality improvement is integral to the QA process and is supported by the centralised JAG infrastructure of JETS, GRS and SAAS. Importantly, a substantial proportion of publications (42%) in this review reported process implementation. Thus, it is encouraging that our review has uncovered the breadth of innovative approaches undertaken to accomplish and surpass minimum JAG standards. Moreover, the international impact of JAG has also been recognised through involvement with at least 16 countries (table 4), with further involvement facilitated by international affiliations at individual institutions. Although the use of JAG tools, for example, DOPS, DOPyS and GRS, have supported research abroad, these have also benefited from international validation. This literature search was designed to be an objective and comprehensive summary of publications related to JAG. As the majority of publications were in abstract form, one limitation of this review is the lack of methodological rigour for selecting studies. The majority were retrospective, with only two abstracts excluded due to poor quality. However, some of these retrospective studies are well designed and have included patient numbers in excess of 100 000 (online supplementary appendix table 1). We acknowledge that there is crossover between JAG quality standards with other national guidelines. As some standards are ubiquitously recommended in guidelines, for example, CIR and ADR, it would not be appropriate to solely attribute these to the impact of JAG. Hence, the search strategy was limited to JAG-relevant terms and some studies may not have been captured. Next, search results were arbitrarily categorised into groupings of impact on care, services and training, which was intended to demonstrate outcomes on patients, units and trainees, respectively. We acknowledge there may be considerable overlap between the search results. This was also true for the subgrouping of studies according to impact and/or implementation. The relative lack of implementation-based data on patient outcomes (3/34 studies) may either indicate potential difficulties for units to implement change, which is a well-recognised barrier, or reflect publication bias, whereby unsuccessful interventions may be withheld. Sharing examples of successful (and failed) implementation measures are necessary to drive quality improvement, a strategy jointly promoted by JAG and the BSG Endoscopy Quality Improvement Project. In addition to future initiatives described above, upcoming agenda include a review of existing certification pathways to ensure these remain current, evidence based and supported by competency-based milestones. Plans to introduce certification in additional modalities of GI bleed haemostasis, ERCP, endoscopic ultrasound (EUS) and capsule endoscopy are also underway, supplemented with procedure-specific curricula, e-learning and JAG-approved courses. The demand for a JETS-like platform for endoscopy nurses to record competencies has prompted the development of JETS Workforce, an e-portfolio platform specific for endoscopy nurses for documenting assisting competencies that could be used to support revalidation. Pressures faced by endoscopy units,140 notwithstanding the imminent plans to introduce faecal immunochemical testing141 and lower the bowel cancer screening age to 50 years,142 are likely to instigate a review of workforce requirements, with emphasis on recruitment and upskilling of existing Bowel Scope practitioners towards BCSP colonoscopy accreditation. NED, which is hosted by JAG, went live in April 2018. The vision of NED is to autopopulate performance metrics of individual endoscopists to centrally benchmark performance, summate unit-level data pertaining to the Clinical Quality domain of the GRS and import trainee metrics directly into JETS. This will eliminate data entry bias and allow for reliable and detailed assessment of endoscopy performance and service activity. The NED promises a data-rich platform for research on endoscopy-based metrics. This is likely to boost the research impact of JAG and will further extend JAG’s influence as an international model for facilitating endoscopy QA. Finally, in recognition that errors in endoscopy are common and under-reported,143 JAG has announced a 5-year strategy to Improve Safety and Reduce Error in Endoscopy,144 145 which aims to improve training and the practice of error reporting, learning from error and implement system-level approaches for safety and performance improvement. This workstream will use the GRS and NED infrastructures and complement JAG’s aspirations to improve communication with endoscopy services to disseminate learning and support services in the UK, and in renewing commitments for placing patient safety and clinical quality at the forefront of endoscopy practice. The UK experience shows that it is possible to achieve a transformation in quality, safety, patient experience and training with a strategic, centrally led, and modestly resourced approach. In addition to the authors listed, we wish to acknowledge the following who have been instrumental in developing JAG’s role in UK endoscopy: Roland Valori and Debbie Johnston, previous chairs of JAG: Tony Morris, Kelvin Palmer; chairs of the QA groups: John O’Donohue, Neil Haslam; chairs of BCSA panel: John Anderson, Brian McKaig. We also wish to acknowledge the substantial contributions of Roger Leicester, staff at the JAG office, all JAG assessors and faculty of training courses. JAG, 2004. Guidelines for the training, appraisal and assessment of trainees in gastrointestinal endoscopy and for the assessment of units for registration and re-registration. http://www.bsg.org.uk/pdf_word_docs/jag_recommendations_2004.pdf (cited 10 Aug 2017).
. PTU-013 Trends in certification for gastrointestinal endoscopy and variations between trainee specialties: results from the UK JETS database. Gut 2017;66(Suppl 2):A57. JETS, 2012. Course finder. https://www.jets.nhs.uk/FindCourseHome.aspx (cited 10 Aug 2017). Hargraves CMK , et al. , 2004. Scoping our practice: the 2004 report of the confidential enquiry into patient outcome and death. http://www.ncepod.org.uk/2004report/ (cited 10 Aug 2017). JAG, 2015. Joint Advisory Group on Gastrointestinal Endoscopy (JAG) accreditation standards for endoscopy services. https://www.thejag.org.uk/downloads/Accreditation/JAG%20accreditation%20standards%20for%20endoscopy%20services.pdf (cited 10 Aug 2017). JAG. JAG accreditation. https://www.jagaccreditation.org (cited 10 Aug 2017).
. Colonoscopy preparation should be tailored to the patient. Colorectal Disease 2009;11:45.
. Quality assurance in colonoscopy – numbers not speciality? An audit of 10 026 colonoscopies. Colorectal Disease 2011;13:1–14.
. A multi-centre audit of 16,064 colonoscopies looking at caecal intubation rates, over a 2-year period. Non-GI operators and those doing. Gut 2012;61:A150.
. PWE-200 The impact of bowel preparation on other colonoscopy quality indicators. Gut 2012;61(Suppl_2):A378.
. Post-colonoscopy colorectal cancer in the United Kingdom: a double-center experience. American Journal of Gastroenterology 2014;109:S608.
. Audit of ERCP key performance indicators in a high volume interventional/biliary endoscopy centre. Irish Journal of Medical Science 2015;184(Suppl 1):S99.
. Routine colonosopic biopsies-should practice change? United European Gastroenterology Journal 2015;3(Suppl 1):A420.
. Comfort during colonoscopy: do nurses tell us more? Gut 2009;58(Suppl 1):A1.
. The impact of bowel preparation on other colonoscopy quality indicators. Gut 2012;61:A378.
. PMO-187 A multi-centre audit of 16064 colonoscopies looking at caecal intubation rates, over a 2-year period. Gut 2012;61:A150.
. A descriptive longitudinal assessment of the endoscopy requirements of 183 consecutive consultant colorectal surgeon posts. Colorectal Disease 2014;16:202–3.
. An audit of GI endoscopic follow up in Sligo regional hospital. Irish Journal of Medical Science 2014;183(Suppl 1):S137.
. A study of gap analysis between perception of the Joint Advisory Group (JAG) and staff members of endoscopy unit regarding quality of care in UK. Journal of Gastrointestinal & Digestive System 2015;5:319.
. An audit of GI endoscopic surveillance in sligo regional hospital. Irish Journal of Medical Science 2015;184(Suppl 1):S323.
. OC-021 Flexible sigmoidoscopy completion rates. Time to change certification criteria? Gut 2015;59(Suppl 1):A9.
. A year in the life of an Independent Sector Treatment Centre (ISTC): the endoscopy service at St Mary’s NHS treatment centre. Gut 2009;58(Suppl 1):A1.
. Audit of clinical indication for recall endoscopy in 974 patients. Gut 2009;58(S1).
. A prospective audit of patient experiences in colonoscopy using the Global Rating Scale: a cohort of 1,187 patients. Can J Gastroenterol 2010;24:607–13.
. A80 The snare project: closing the loop on synoptic endoscopic reporting and skills assessment - program and abstracts from the canadian digestive diseases week 2016. Canadian Journal of Gastroenterology and Hepatology 2016;2016:51.
. Development of a paediatric endoscopy global rating scale: Results of a national pilot. Journal of Pediatric Gastroenterology and Nutrition 2017;64:25–6.
. G189(P) Development of an annual endoscopy audit plan using measures in the P-GRS(paediatric global rating scale for endoscopy) in a tertiary paediatric endoscopy service to facilitate quality improvement. Archives of Disease in Childhood 2017;102(Suppl 1):A76.
. The global rating scale in clinical practice: a comprehensive quality assurance programme for endoscopy departments. Digestive and Liver Disease 2012;44:919–924. , 2015. Report prepared for the Ministry of Health: Governance of endoscopy quality and related initiatives - report for stakeholder feedback. https://www.surgeons.org/media/21905792/2015-06-05_rpt_governance_of_endoscopy_quality_and_related_initiatives_report_for_sta.pdf (cited 21 Aug 2017).
. Attaining JAG endoscopy competency during higher surgical training - The trainees experience. Colorectal Disease 2010;12:42.
. Endoscopy training in 2008: Results from the TiG/BSG national training survey. Gut 2009;58(S1).
. The WIMAT colonoscopy suitcase is a valid simulator for polypectomy training. Surgical Endoscopy and Other Interventional Techniques 2013;27:S340.
. Polypectomy skills of gastroenterology fellows: can we improve them? Endosc Int Open 2016;04:E182–E89.
. Accelerated training in upper GI endoscopy-an analysis of SPRINT programme outcomes. United European Gastroenterology Journal 2015;3(Suppl 1):A368–A369.
. PTH-044 The National Endoscopy Database (NED) Project. Gut 2016;65(Suppl 1):A240.
. PTU-009 Competency of endoscopic non-technical skills (ENTS) during endoscopy training. Gut 2017;66(Suppl 2):A54.
. PTU-010 Exposure to endotherapy for upper gastrointestinal bleeding at the point of gastroscopy certification – is it sufficient? Gut 2017;66(Suppl 2):A55.
. Colonoscopy quality and safety indicators: 356. Colorectal Dis 2011;13:57. Office for Public Management, 2017. Accelerated non-medical endoscopist training programme: report to health education England. http://www.opm.co.uk/wp-content/uploads/2017/06/OPM_NME-Year-1-Evaluation-Report-Final.pdf (cited 18 Oct 2017).
. Colonoscopists can accurately self-assess their performance when using the wimat colonoscopy suitcase polypectomy trainer. Surgical Endoscopy and Other Interventional Techniques 2013;27:S340. , 2013. Shape of training. http://www.shapeoftraining.co.uk/static/documents/content/Shape_of_training_FINAL_Report.pdf_53977887.pdf (cited 18 Oct 2017). Public Health England, 2018. Bowel screening to start at 50. https://www.gov.uk/government/news/bowel-screening-to-start-at-50 (cited 17 Sep 2018).
. PTH-044 Improving safety and reducing error in endoscopy (ISREE) – a JAG initiative. Gut 2018;67(Suppl 1):A34. Contributors KS performed the literature review and produced the initial draft. RB provided historical insight in the development of JAG. JAG section headings were cowritten by the leads of JAG subdivisions (MF: JAG International; NH: Quality Assurance of Training; JTG: Endoscopy Services Quality Assurance Group; PD: JETS lead). JRB and JS are previous chairs of JAG and confirmed the accuracy of the manuscript. ST-G holds the current chair of JAG, initially commissioned the review and is the article guarantor. All authors provided critical review and helped to shape the final version of the manuscript.